The first of the two being Stampin' Up! 's new Summer Mini Catalogue packed with all the loveliness that can be expected from any SU catalogue. The gorgeous goodies in this catalogue are available from now through to 31st March 2012. Click on the catalogue below to view or please let me know if you would like your very own copy mailed to you. 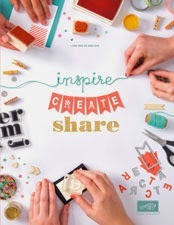 Some of my favourites in this catalogue are the super sparkly glimmer paper, the gorgeous Spice Cake DSP and fabric, baker's twine and 'Marry Me' stamp set. 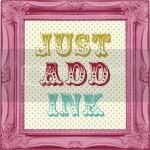 The second bit of excitement is Stampin' Up! 's 'December Frenzy'- with savings of up to 50% on selected items. Click on the picture below for more details. If you haven't already got the 'Welcome Christmas' stamp set this is one of my great Christmas loves and a bargain at 50% off in December. 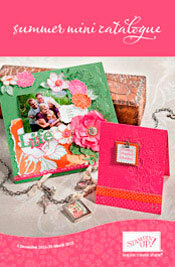 I already own more than half of the stamp sets on sale- so I personally think Stampin' Up! has selected some fantastic sets for it's 'December Frenzy'- and I can see myself adding 'Clearly For You' to my collection seeing as it is a beautiful set and even more gorgeous at 50% off. I'll also be getting the Distressing kit which I have been eyeing for ages. If there is anything you just absolutely love and have to have then don't hesitate to contact me and I can order it for you and have it shipped straight to your doorstep asap. I have been a busy little bee just lately with lots of Christmas workshops, classes and orders. With things hopefully being a little quieter around here for the next week or so I am hoping to pop back on here and post some photos of all my Christmas creating.